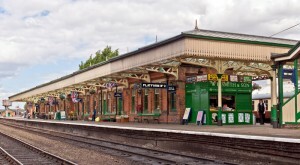 Loughborough Central station is the busy headquarters of our railway. Opened in 1899, it was a large station for what was a comparatively small town on the Great Central Railway's line to Marylebone station in London. It was awarded handsome facilities, like a goods yard, a handsome goods office (now Lovatt House and in use as our main offices), a hotel and of course all the rooms you can see today on the platform. Today the station is restored to reflect the style of the 1950s. To reach the platforms, you enter the station through a handsome wooden panelled Booking Hall, then descend a wide stairway arcade. (A new passenger lift was installed by the Booking Office in 2009 and the every room now has ramped access, so it is fully accessible if you use a wheelchair). On the staircase, look out for the wooden ramp which was once used to slide parcels down! The platform is “island style” - in other words it is between the two sets of running lines. There is a platform one and two - but only one set of buildings to serve both. The station is protected from the British weather by a beautiful glass, metal and wood canopy - meaning you'll be dry as you explore the listed station. This canopy was the subject of a major restoration between 2010 and 2013. There is a Shop, Buffet and Stationmaster’s office and an Emporium selling second hand “railwayana”, “bric-a-brac” and magazines. There are two waiting rooms (one which is called the Ladies Waiting Room and contains toilets) and a General Waiting Room with a wonderful display of 1950s posters and a film show. On cold days the waiting rooms have lovely open coal fires. There is a wheelchair accessible toilet which also has a baby change. At the end of the platform is the Gents toilet. Meanwhile, close to the stairs (next to the lift entrance on the platform) is a great small exhibits Museum. 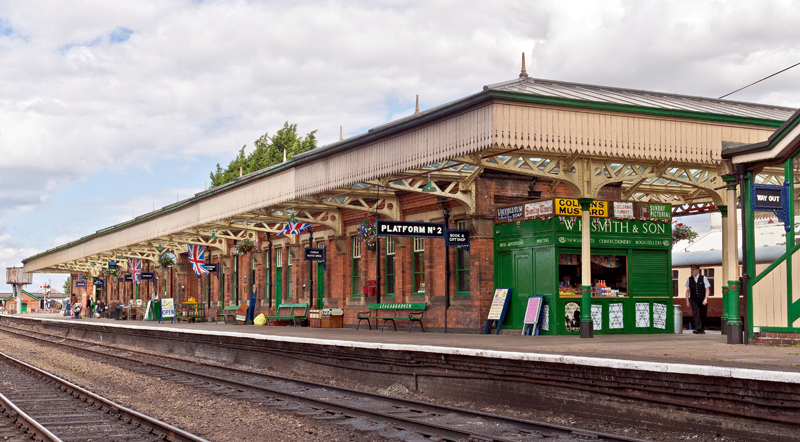 Loughborough is a great station to visit because of its rich history. It has appeared in several films and Sir Anthony Hopkins and Nicole Kidman are two actors who have visited. As the operational headquarters of today’s GCR, you'll often see trains waiting there next turn of duty. During a gala the action is non-stop with trains arriving and departing all the time. We believe it's as close as you can get to the authentic atmosphere of a busy station when steam ruled the rails. Meanwhile, follow the path off the end of the platform to reach the water tower where engines take on water - you can get a close up view, but watch out for the splash! A little further is the Locomotive Shed and Signalbox. If you are breaking your journey at Loughborough, the town centre is around ten minutes walk away, with a good range of shops, a Saturday market and a park with historic bell tower. There are other great museums including the Bell Foundry which is close to the railway. Enjoy your visit and if you need any help or directions, look out for a member of staff in uniform or knock on the Stationmaster's office door.